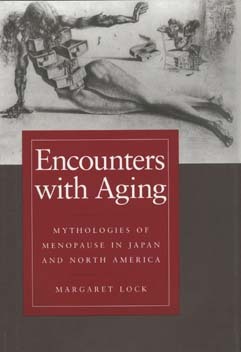 Margaret Lock explicitly compares Japanese and North American medical and political accounts of female middle age to challenge Western assumptions about menopause. She uses ethnography, interviews, statistics, historical and popular culture materials, and medical publications to produce a richly detailed account of Japanese women's lives. The result offers irrefutable evidence that the experience and meanings—even the endocrinological changes—associated with female midlife are far from universal. Rather, Lock argues, they are the product of an ongoing dialectic between culture and local biologies. Japanese focus on middle-aged women as family members, and particularly as caretakers of elderly relatives. They attach relatively little importance to the end of menstruation, seeing it as a natural part of the aging process and not a diseaselike state heralding physical decline and emotional instability. Even the symptoms of midlife are different: Japanese women report few hot flashes, for example, but complain frequently of stiff shoulders. Articulate, passionate, and carefully documented, Lock's study systematically undoes the many preconceptions about aging women in two distinct cultural settings. Because it is rooted in the everyday lives of Japanese women, it also provides an excellent entree to Japanese society as a whole. Aging and menopause are subjects that have been closeted behind our myths, fears, and misconceptions. Margaret Lock's cross-cultural perspective gives us a critical new lens through which to examine our assumptions. Margaret Lock is Professor in the Departments of Social Studies of Medicine and Anthropology at McGill University. She is coeditor of Knowledge, Power, and Practice: The Anthropology of Medicine and Everyday Life (California, 1993) and author of East Asian Medicine in Urban Japan (California, 1980). In 2003, she was awarded the Robert B. Textor and Family Prize for Excellence in Anticipatory Anthropology, of the American Anthropology Association. Wellcome Medal for Anthropology as Applied to Medical Problems, Royal Anthropological Institute of Great Britain and Ireland. 1997 J.I. Staley Prize for a book that exemplifies outstanding scholarship in anthropology, School of American Research.